Neither Erin nor I can recall which of us added this to the Netflix queue, so we were going in a bit blind, and were delightfully surprised. 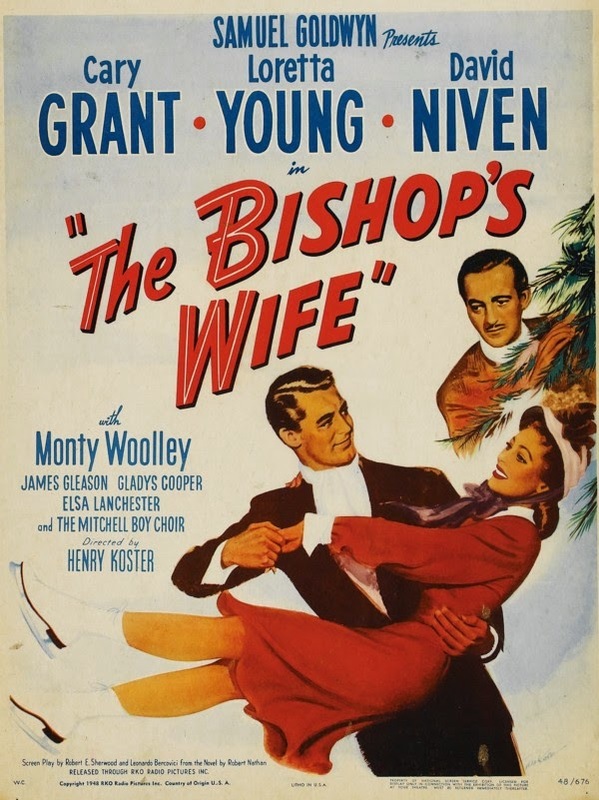 The Bishop’s Wife opens by introducing Cary Grant, who proceeds to step in front of speeding cars while helping old men across the street and rescuing babies and more or less being possibly-magical. He takes a casual eavesdropper’s interest in the woes of a beautiful young woman, Julia, who happens to be the bishop’s wife. Then we meet the bishop, Henry, at home. Henry is trying raise money to get a new cathedral built, and due to the process and stress of doing so, he’s screwing up his relationship with his family and his faith. He prays for guidance. He gets Cary Grant. Grant says that his name is Dudley, and that he’s an angel sent to help the bishop. The bishop is naturally skeptical of this. Dudley proceeds to act as the bishop’s ‘assistant’, even though mainly what he does is charm every woman on screen, including Julia. Once Henry realizes that Julia and Dudley are having a fine old time together, he tries to get Dudley to leave. It doesn’t go well for him to cross a dude with supernatural powers. Dudley eventually comes clean about the fact that he knows he’s in the wrong: he’s broken the first rule of angel-ing and gotten emotionally involved. To make it up to Henry, he helps solve the money problem, and the faith problem, and gives him a leg up on how to make it all up to Julia. Everyone goes home happy, except maybe Dudley. There are some really interesting implications that aren’t answered in this light, bubbly comedy. What happens if an angel falls in love with a human? What does love even mean for an immortal? What keeps an angel’s power in check? Dudley doesn’t seem to have any rules about his powers, he uses them to embarrass people, to pick locks, to get people drunk, to figure-skate impressively and to win a snowball fight. He’s almost a Puck-like figure. We both really enjoyed this movie, and recommend that more people drop it into their Netflix queues.